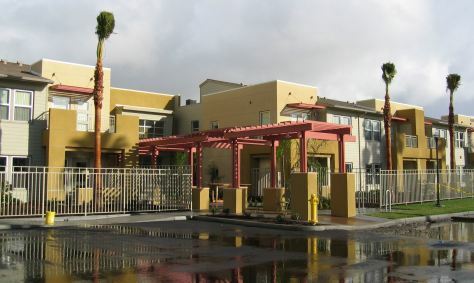 Senior apartments provide affordable units for Ontario residents. Ontario recognizes the importance of an adequate supply of affordable housing and its importance to the quality of life of residents. Residential developments in the New Model Colony and Ontario Airport Metro Center area will provide quality housing opportunities to attract and retain Ontario’s workforce and support Citywide economic development goals. Lower and moderate income residents will require homeownership and rental assistance to secure and maintain housing. Housing prices and rents in Ontario and across the region continue to lead to lower homeownership rates, longer commutes, increased traffic congestion, higher cost burdens, and overcrowding in neighborhoods. Working with partners and the state and federal governments, the City of Ontario is committed to providing a range of housing types and prices affordable to all economic segments of the City and assisting residents and the workforce to secure and maintain housing that is affordable and appropriate to their needs. Increased opportunities for low and moderate income households and families to afford and maintain quality ownership and rental housing opportunities, including move-up opportunities. Preservation of Affordable Apartments. We strive to facilitate the preservation of the affordability of publicly assisted apartments for lower income households through financial assistance, technical assistance, rehabilitation, and collaborative partnerships. Homeownership Opportunities. We increase and expand homeownership rates for lower and moderate income households by offering financial assistance, low-interest loans and educational resources, and by working in collaboration with partnerships. Rental Assistance. We support the provision of rental assistance for individuals and families earning extremely low, very low, and low income with funding from the state and federal government. Mixed-income Housing. We encourage the integration of affordable housing in the New Model Colony, Ontario Airport Metro Center Area, and existing neighborhoods. Collaborative Partnerships. We support collaborative partnerships of nonprofit organizations, affordable housing developers, major employers, and for-profit developers to produce affordable housing.